Air leakage testing is something that should be carried out during construction of a property and will determine how well the building keeps the air inside and therefore how well it retains heat. There will always be space for some air to escape but this should ideally be kept to a minimum to decrease heat loss. Exact figures of 0.60 AC/H @ 50 Pascals of pressure have even been specified as a strict guideline. Recently a couple living in Alaska, USA have been entered into the World Record Academy for having the tightest house in the world. That is to say that the owner and builder of the house, Dr. Tom Marsik, has managed to create a dwelling that has recorded ‘phenomenally low’ figures in terms of air leakage and air tightness. The test used to determine this is known as a blower door test and blasts air into the building at 50 pascals of pressure whilst measuring the amount of air changes per hour; hence the unit of measurement AC/H50. As stated before the standard set is 0.06 AC/H50 but this remarkable property tipped the scale at just 0.05 AC/H50. Dr. Marsik, who unsurprisingly works at the University of Alaska as an assistant professor in sustainable energy, says that although these results have been created with a relatively small house (the home being only 600 square feet in size) it demonstrates that with acknowledgement of the importance of environmental issues it is possible to build truly energy efficient homes. 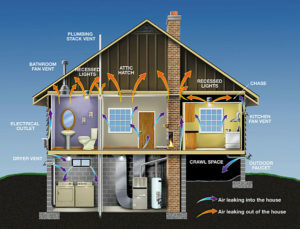 Making your home as air-tight as possible is not the only way that you can increase its energy efficiency and the world record home in Alaska has many other features to increase its ability to be environmentally conscious. Additional features include: the fact that the home requires no conventional heating source (mainly because of its size), low flow plumbing fixtures, specially designed argon-filled energy efficient windows and the fact that it is entirely operated by electricity. So how does your home compare to this ultimate energy efficient role model? Are you really doing enough to acknowledge the effect that increased energy consumption and carbon emissions are having on the environment? Or is it time to upgrade your home to a green house? Why not use this summer to prepare your property for the next grueling winter that we’re sure to endure.